Scott Adams created a cartoon phenomenon with Dilbert, the workplace warrior. Now he takes on the next century with his usual bad attitude. I borrowed this book from a friend in January but until I had to take a boring cross country car trip, I never had the time to complete it. Perhaps life is too serious for some, but I have to confess I found this book released some 13 years ago in 1997 and billed as "hilarious" – is actually rather silly, witty and weird. It is, obviously, entertaining to a degree, but the author Scott Adams, creator of the hit comic strip - Dilbert takes a rather narcissistic, sardonic approach to the droll side of life which some may not find agreeable. However, the book's "prequel", The Dilbert Principle, was rated a best-seller so it must be understood that there are ample readers out there who did get a chuckle or two out of the follow-up including me. 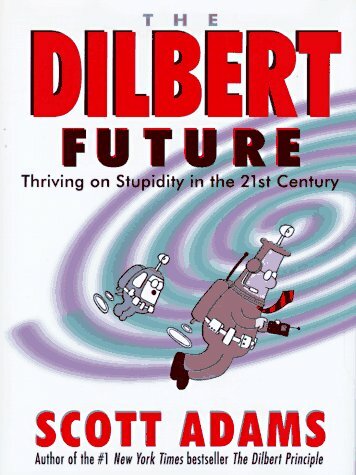 In this book, Scott Adams tackles predictions for the future, turning Nostradamus upside-down in the process – with an outlandish tone that deals with a multitude of subjects like technology, gender relations, the workplace, society and so on. Altogether 64 predictions are dotted throughout the book in little "boxes", interspersed with Dilbert cartoons, amusing anecdotes and plenty of "bumph"! Examples of some of these gems include "Most scientific and technical breakthroughs in the next century will be created by men and directed at finding replacements for women" and "In the future poverty will be eliminated, along with the people hoarding all the money". Personally I prefer reading a book which enhances either my knowledge or insight, or at least entertains – Adams' work mostly seems to have no purpose other than "a bit of irrelevant nonsense" and a laugh. If that's what you enjoy, it is highly recommended but for some perhaps it might be only useful as a funny time-waster on the toilet-seat!